Tan bodies on the beach, shady palm trees, pink flamingos and a beautiful ocean breeze… that is the idyllic life we expect from the sunshine state of Florida. Then reality hits – in the form of 120 mph destructive hurricane winds, torrential downpours and storm surges. Mother Nature also throws in a bit of sand, dirt and humid salt air to really disrupt equipment performance. Excessive dirt and dust is a major concern for the Youngquist Brothers Rock Inc., the largest deep-injection well contractor in the United States. Located in Fort Myers, Florida, the Youngquist’s rock quarry blasts, digs, crushes, sizes, and ultimately moves 2,500 tons of sand, limestone aggregate and gravel every hour. 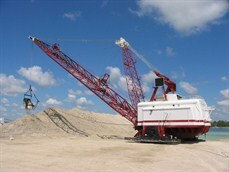 One of the largest investment decisions in any rock quarry is to determine the size of the dragline to do the digging. In an area of the country where unstable ground conditions have historically supported 400,000 pound draglines, the Youngquist Brothers brought in an innovative and industry first 4 million pound machine! The Bucyrus Erie 1260W was brought in from Canada to the mine site in Fort Myers and custom built to recover 9.6 million tons of limestone per year. What was not taken into consideration was the havoc Florida’s climate would create for the six intake fans that force the necessary 180,000 CFM’s of air into the dragline equipment. Inadequate air flow was causing system breakdowns and costly equipment downtime. The system was originally developed with paper filters, one per intake fan. Unfortunately these paper filters couldn’t keep up with the dirt levels and Florida’s humidity. Replacements were needed every 9 months, and became very costly. Cleaning was done every 3 months, with extensive equipment downtime needed for service. After an internet search, Brett Youngquist, the dragline supervisor, decided to look into Permatron’s patented PreVent® Equipment Protection Filters to effectively prevent debris from entering and clogging the air intakes. These air filters are custom designed and manufactured to the equipment’s specifications. In this case, the dragline equipment needed a total of 16 custom sized 60″ x 80″ custom air filters with 4 layers of UV protected electrostatic polypropylene media. 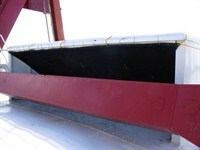 Vinyl binding was sewn on the edges with heavy duty grommets evenly spaced and mounted into the edging for attachment. The Permatron PreVent filters are allowing 35% more air into the dragline system, and preventing a greater amount of dust and rock particles from entering the equipment then the previous filtration system did. PreVent filters have alleviated much of the equipment downtime and simplified the maintenance routine. They are easily cleaned by rinsing in place. 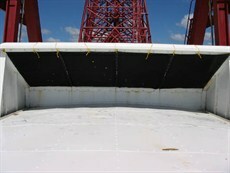 In addition, the 3-dimensional media is UV protected and contains an inherent electrostatic charge that won’t diminish over time, so it will provide the Youngquist Brother’s dragline equipment years of protection. For a major equipment investment with an average expected lifespan of 40 years, the logical choice was made to PreVent® the damage before it was too late with Permatron air filters!